Curious to try some Colombian food which is not fried? Nothing against empanadas and buñuelos (we LOVE them! ), but why not explore the healthy and truly diverse side of our local gastronomy? 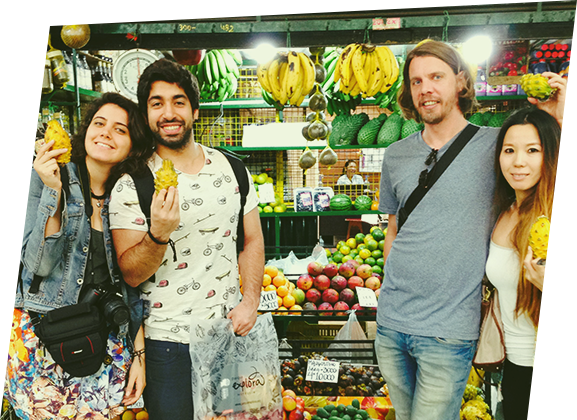 Join us on a walk through one of Medellin’s main markets and see, feel and taste what makes Colombia the first country in the world in terms of fruit biodiversity. Learn about a variety of exotic fruits and try them with us. In this tour we will guide you through the labyrinth of one of Medellín’s main indoor markets. We will stop at different fruit stalls to taste over 10 exotic fruits, most of which you are likely to never have seen before (we’re not talking mangos and pineapples!). We will introduce you to some of the vendors, and explain the benefits of each fruit as well as how to recognize ripeness/quality. At the end, there will be a chance to sit down at Don Rigo’s “smoothie bar”, where you can enjoy a fresh fruit juice/smoothie. Join us on this tasty adventure and make sure to come hungry! Monday to Sunday at 10:30am. Additional tour at 9:45am depending on demand. US$ 21 + VAT (refundable). Includes fruit tasting and a fresh juice. Small group guaranteed (Max 8). Foreign tourists not residing in Colombia have the right to a refund of the VAT paid, which is 19%. If you submit the required documents, we will apply this refund. Detailed directions will be sent in your booking confirmation.